We offer this location on request. Bologna is another part of Italy that many American tourists skip on their way between Florence and Venice but we have found it to be a real gem. 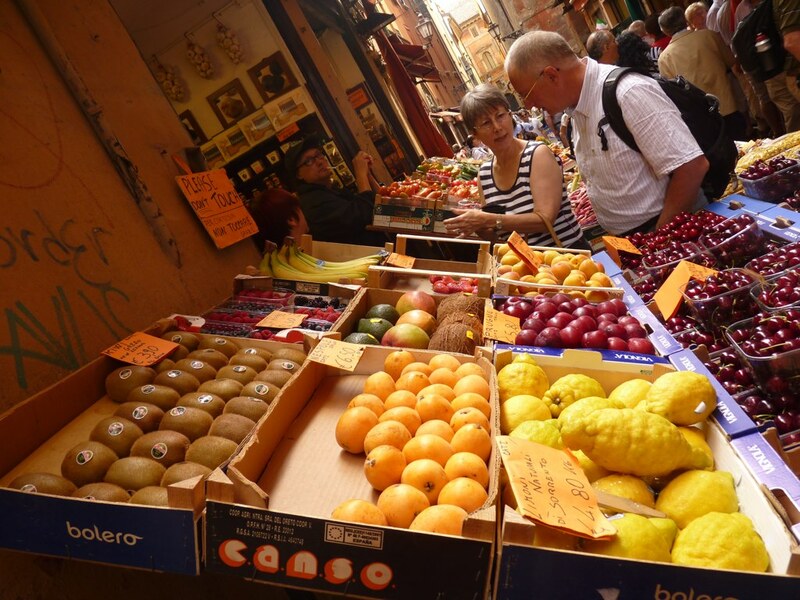 Bologna is known to be the culinary capital of Italy, with Parma and Modena nearby. Spending a morning shopping in the outdoor market followed by a cappuccino at one of the hundreds of street cafes, then a lunch of homemade tortellini is, in our opinion, a perfect way to pass a few hours. Bologna feels like a very typical small Italian city. English is not, widely heard and the university (the oldest in Europe!) keeps the town quite lively with students, music and culture. You can walk (or bike) everywhere and those iconic porticoes will keep you dry throughout the town. We stay at a very central Dominican monastery with plenty of single and double rooms with ensuite bathrooms. Currently we don’t have any workshops scheduled for this location. This is an entirely charming area on the Mediterranean coast near Genoa. Cinque Terre means “5 towns”, that are linked together by hiking trails, rail lines and boat routes. The landscape literally rises out of the sea for a dramatic vertical effect. There are no cars in the towns so walking is essential. The food of this region is special, featuring primarily pesto Genovese and plenty of fresh seafood from the area. For us, Cortona is one of the most charming Tuscan hill towns there is. We only schedule this special location on request. The Medieval streets and palazzos make you feel like you have gone back in time. The double piazzas are gathering points for the residents with abundant cafes and restaurants. But just a little out of the center you can climb the narrow streets to the residential areas with spectacular vistas of the surrounding Tuscan and Umbrian landscape as well as Lake Trasimeno yawning in the mist. For day trips there are many options from Florence to Perugia and Assisi. But one of the most inspirational excursions would be to the Celle of St. Francis, a peaceful, functioning monastery actually built by the saint. His cell and chapel are still there carved into the hillside. 900, that is the year that this winery first shows up in the Tuscan records. It has been producing Chianti wine ever since. Today it is a small commercial winery in the heart of the Chianti Classico area of Tuscany. The people who work here have been a part of this family for years – some literally since birth if they were brought up in one of the authentic stone and terra cotta farmhouses that pepper the Dievole property. For our final program of the year, the Autumn Arts Festival, we typically take over the entire villa and winery for 10 days at the end of the harvest season. What can you say about Florence that hasn’t already been said? The center of the Renaissance, city of art, land of the Medicis, historic, graceful, and an ideal place to spend a week. There are many churches and museums throughout the city beyond the iconic Uffizi and Academia galleries with priceless artwork by some of the greatest masters of the last 500 years like Michelangelo, Fra Angelico, Vasari, Cellini, Filippo Lipi, Donezetti, and on and on. Everywhere you go you are walking in their footsteps. You can’t absorb Florence all at once so it’s good to have the opportunity to visit locales leisurely, have lunch in a family trattoria in a neighborhood piazza, sip a little Chianti and then saunter to another place to appreciate the spirit of Firenze. During our programs, we typically reserve an entire historic residence in a quiet neighborhood across the Arno from the center of town. This gives you the chance to relax and retreat after all the stimulation of this city. You can easily walk to the center or use the city buses to get around. This north-central area is often overlooked by American tourists but, like so many areas of Italy, the natural beauty can be splendid. Lake Garda lies halfway between Milan and Venice in the northern area of Italy. It is the largest lake in Italy, extending nearly to the border of Switzerland. Our venue is an ex-convent on a hill overlooking the lake between the town of Gargnano and the village of Villa, where D. H. Lawrence lived and wrote for a time. The simple convent surrounds an authentic cloister (chiostro) with several tiers of gardens behind and beside the structure. There are also 2 studios available for classes. Rooms are basic, with bathrooms but shared showers. Our chef prepares dinner here each evening which we eat in the large dining room. There are plenty of options for lunch in one of the towns nearby. For local activities, there is a regular ferry that traverses the lake, many hiking trails, the Vittoriale, the country villa of the Italian poet D’Anunzio and small beaches to swim in the lake, weather permitting. Four our 3rd Il Chiostro-Upside Down program we will head to exotic New Zealand. We’ll stay at Black Barn vineyards at Hawkes Bay on eastern coast of the North island. The program will consist of two concurrent workshops, painting and photography. Enrollment is strictly limited to 12 guest rooms, so please register soon. This ex-monastery, called San Fedele, was built in the 12th century. That alone makes it one of our most unique venues. It was bought by a couple from Milan in 2001 and completely renovated. Today it is known, not as a hotel, but as a historical residence. Il Chiostro teams with San Fedele to do arts workshops in this tranquil, inspirational setting. The monastery is located about 12 km north east of Siena in the Chianti hills. It is a quiet location ideal for a week’s retreat, taking you away from the distractions of your daily life and giving you the peace and space to concentrate on your creativity. The closest town is Radda, a medieval town, about 15 minutes drive. Although this is one of our larger venues composed of 16 guest rooms, it is also an intimate setting with the owners onsite ready to discuss the history of the monastery as well as their extensive, 6 year renovation of the property. The property includes a large ex-church common room, a dining room, large terrace extending all along the back of the structure, a breakfast room and a multi-media room. Exterior spaces include a rose garden, vegetable garden similar to what the monks used from the Middle Ages onward, and a large central piazza. In season, there is also a large, Olympic sized swimming pool on the lower section beside the olive grove. San Fedele is reserved entirely for us during our programs, so we won’t need to share the space with other guests. Living La Dolce Vita in Tuscany! En Plein Air-Painting Under the Tuscan Sun! This is one of our most intimate yet elegant spots – a historic nobleman’s villa in the beautiful Val d’Orcia area of Tuscany just south of Siena. It’s near Montalcino, well-known for Brunello wine. Our tiny town of San Giovanni d’Asso is actually the truffle capital of Italy. The elegantly appointed villa where we stay is was at one time home to a noble Italian family. The palazzo includes a formal garden, private swimming pool with inspiring vistas. Inside there are 8 twin, double or single bedrooms in the villa, each with a private bathroom. The rooms are decorated in authentic, elegant family antiques. Dinners are prepared by our personal chef which we eat family style either in the dining room or on the outdoor terrace. The villa is across the street from a historic castle and within easy walking distance of the town where there is a grocery store, cafe, restaurant and even an outdoor green market once a week. Venice – La Serenissima! This is a great city of the world that is pure enchantment. We offer programs here for 2 weeks in October when the tourist rush has died down, but the weather is (can be) still warm and sunny. It is a real privilege to spend a whole week getting to know this town without rushing through. Take time to explore the back canals away from San Marco, wander the quiet streets at dawn listening to your own footsteps, feel your way through the evening mist and visit the smaller art treasures scattered throughout this mecca of culture. For centuries artists have come to Venice to try to capture its unique setting on the lagoon and when you settle in you’ll understand why. We stay at an ex-convent in the quieter area of Dorsoduro, close to the Accademia Bridge and away from the madness of San Marco. Meals are traditional cuisine at local restaurants and some even prepared by our personal chef. It is easy to be independent in Venice and walking everywhere is essential to understanding this floating city. There is a wealth of museums, galleries, markets, historical sites and classic architecture to stumble upon. Every other year Venice hosts the art Biennale where most countries of the world send their promising artists to display their work. There is just nothing like Venice.